Louisville’s last abortion clinic is a battleground for the militant anti-abortion movement. For a picture of the newly emboldened, militant anti-abortion movement, look to Louisville. 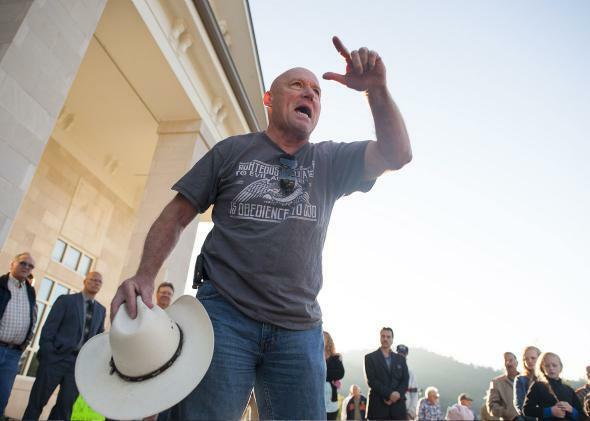 Operation Save America’s Rusty Thomas speaks during a protest outside of the Rowan County Courthouse in 2015 in Morehead, Kentucky. On May 13, members of the anti-abortion group Operation Save America walked solemnly to the entrance of the EMW Women’s Surgical Center, the last abortion clinic in Louisville, Kentucky. They sat down with their backs to the door and, as other protesters prayed nearby, refused to move. Eleven people, including Operation Save America’s director, Rusty Thomas, were arrested. It was the first such coordinated clinic blockade in 13 years and a sign that the militant wing of the anti-abortion movement feels newly energized in the wake of Donald Trump’s election. “We’re expecting some major breakthroughs in the coming weeks and months,” Thomas told me recently. He is hopeful that Kentucky, now one of seven states with only one abortion provider, could soon become the first state with none. In the past, radical anti-abortion activism, as well as anti-abortion harassment and terrorism, has waned during Republican administrations, when abortion opponents have direct access to power. But Vicki Saporta, the president of the National Abortion Federation, said she’s been surprised to see anti-abortion invective increase in the wake of Trump’s victory in November. In the first five months of 2017, she explained, there have been four times as many online threats and death wishes directed at abortion providers compared with the same period in 2016. “There seems to be an emboldening of anti-abortion extremists with this new administration,” she said. Willie Parker, the chairman of Physicians for Reproductive Health and an abortion provider in Alabama and Georgia, said protesters have grown more brash in their incursions onto clinic property and more “fierce and confrontational” in their rhetoric. There is “a presumption of protesters to believe that government is now on their side,” he said. It’s as if the anti-abortion movement, like other sectors of the far right, are feeding off Trump’s antinomian energy. That’s why, when Operation Save America holds its annual conference in Louisville this weekend, pro-choice activists are bracing for a siege. EMW is already embattled; entering the clinic means navigating a gauntlet of anti-abortion demonstrators, some of whom videotape patients as they arrive. The protesters have microphones, and they often attempt to shame women for seeking abortions. In one video taken by the Feminist Majority Foundation, a white preacher with a headset mic stands on a makeshift platform directly in front of the clinic and shouts, “Murdering children is an excuse to cover our sin, so we can live a life of sin! … So we can live the gangster rap life!” Flanking him are people holding posters showing wildly enlarged photographs of bloody fetuses. In a call with journalists on Thursday, Meg Sasse Stern, one of the volunteer escorts who helps EMW clients make their way past demonstrators and into the clinic, said that she and her colleagues “have definitely seen increased aggression both from national and local protesters” in recent months. Earlier this week, an unknown person kicked in the clinic’s front door. Abortion in Kentucky is also under attack legislatively. In November, Republicans took over Kentucky’s House of Representatives for the first time in 95 years, meaning the GOP has total control of the state. “It’s a drastically changed political climate,” said Ernest Marshall, the abortion provider who founded the EMW clinic. “We have no political support in this state.” Kentucky recently passed a mandatory ultrasound law and a 20-week abortion ban. And the state tried to close EMW by challenging the adequacy of its transfer agreement with the nearby University of Louisville Hospital. A hearing in September will determine whether EMW can remain open. “We are under assault,” Marshall said. If this is the case, Thomas wants to step it up. He hopes to persuade Kentucky Gov. Matt Bevin to defy the courts and the federal government and ban abortion in Kentucky unilaterally. As justification, Thomas cites an anti-government doctrine developed by Matthew Trewhella, a Wisconsin pastor who straddles the anti-abortion fringe and the militia movement and who has become one of Thomas’ most important allies. In 1993, Trewhella joined the most extreme figures in the anti-abortion movement in signing the so-called defensive action statement, an infamous declaration that called the murder of abortion doctors “justifiable.” Thomas describes this as a regrettable lapse in judgment on Trewhella’s part, with no bearing on his later work. He credits Trewhella, who has also called for the creation of church-based militias, with revolutionizing his own thinking about politics with Trewhella’s 2013 book, The Doctrine of the Lesser Magistrates: A Proper Resistance to Tyranny and a Repudiation of Unlimited Obedience to Civil Government. Drawing on ideas long in circulation on the far right, Trewhella argues that lower-ranking civil authorities, like city and state governments, have the right and the duty to contravene ungodly laws from above. By invoking the doctrine of the lesser magistrates, Thomas believes, Kentucky could simply declare Roe v. Wade void in the state. If he believes Kentucky could be the first, it’s partly because Bevin has warmly welcomed Thomas’ group to the state. Bevin addressed Operation Save America’s leadership meeting in Louisville in February and later met privately with some of its members. In a report on the meeting sent out to OSA supporters, Thomas recounted that Trewhella gave Bevin a signed copy of The Doctrine of the Lesser Magistrates. Bevin, wrote Thomas, said that he’d already read it and has passed it along to others as well. Speaking of Trewhella’s doctrine, Thomas told me, “It just appears that Kentucky may be the first ones who take it seriously enough to cross that line and finally do their duty in the midst of this Holocaust.” Victory, to him, seems like it has never been closer. Pro-choice forces were similarly unsure about where the Justice Department stood. “Unfortunately, we’re used to dealing with threats and violence against abortion providers,” Saporta told me. “But when we had murders in the past, we could go to the Department of Justice and ask for their help and be assured they would take these things seriously.” In the past, she explained, the Justice Department has dispatched U.S. Marshals in the wake of murders, instructed every FBI field office to stay in contact with local abortion clinics, and done threat and risk assessments to make sure that providers were safe. She worried that with Sessions in charge, abortion providers couldn’t expect the same level of cooperation. Pro-choice forces in Kentucky are preparing for it. They are expecting hundreds of protesters to converge on Louisville in the coming days. One anti-abortion group is bringing a Jumbotron to town and will use it to broadcast footage of an alleged abortion across from City Hall. The National Abortion Federation has deployed security staff to Louisville and is working closely with local police as well as the U.S. Marshals Service. “They are trying to shut down this clinic, and I think they’ll go to whatever extremes they think they can get away with,” Saporta said. Operation Save America disavows violence, but to Stern, that’s little comfort. “Part of the risk to having such an uncontrolled environment, it’s impossible to take any one person’s word as truth to how any individual may or may not behave,” she said. So far, the clinic isn’t changing its operating hours. But getting an abortion in Kentucky is hard in the best of times. This weekend it’s going to be brutal.